I’ve spotted a few things that are different on this most northernly island and I thought I’d share them with you. The convenience stores all have Snickers. Since the only other energy-bar type thing I’ve found is SoyJoy (very tasty but not enough in it) the presence of Snickers is a great thing. Some of the bigger petrol stations have showers for truckers. I reek so I should probably use one soon. There are more independent travelers here. There are still loads of busses carting the crowds around but I’ve seen quite a few mini-vans with mattresses in the back, proper campervans and bikes laden with camping gear. I filmed one such cyclist as he approached so he pulled over to say hi. 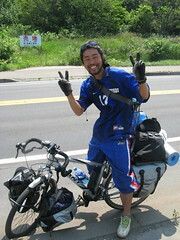 He’d just ridden from Cape Soya and was heading to Okinawa the very, very southern most island. I think it’s hundreds of kilometers further south than Kyushu. Cool young guy and happy to talk. He said there was another walker bound for Soya about 20km north of me. That’s quite a distance to catch up before Sapporo so maybe I’ll see him on the final section. Things that haven’t changed include the driving. People are still overtaking where they can’t see oncoming traffic. I saw one guy overtaker drive into the verge (where I was walking) to get past someone where the central barrier was blocking overtaking. Huge trucks sit so close on the bumpers of little soft cars that if that car had trouble changing gears and slowed even for an instant they’d be crushed beneath the behemoth behind them. 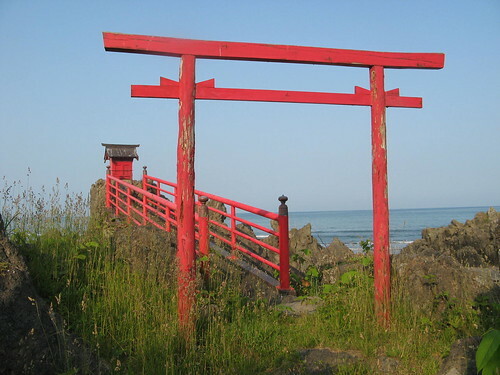 Also unchanging is the Japanese spirit of giving. I got a huge iceream yesterday for less than the stated price, plus a free bottle of mineral water, and tonight a fisherman who had parked near my tent left and returned with a hotdog and coffee he had purchsed just for me. This afternoon turned into evening as I staggered along the beach trying to find somewhere hard enough to pitch a tent with a clear view of sunrise. In the end I had to settle for a bit of the seawall to my east and the noisy road not far away. But it’s free and I need that right now. I still reckon its cos they think you’re homeless.